Simon Madden has been a heavyweight performer in elite sport, education and business. With 15 years as a teacher in the northern and western suburbs of Melbourne and 14 years in information technology, media and marketing industries, Simon knows what it takes to be successful. Between careers in education and business, Simon somehow managed to fit in 19 years as an elite performer in Senior Australian Rules Football. In the process of playing 378 senior games for the Essendon Football Club, Simon captained Victoria in state of origin competition, won two premierships and was named All-Australian nine times. He was also involved in the Players Association, spending time as president and laying much of the groundwork for the current success of the association. After football Simon moved into the corporate world with roles in sales and management, dealing with large corporations and government bodies. During this time he was inducted into the Essendon and AFL hall of fames. Simon and his brother Justin’s careers were immortalized by the introduction of the Madden Cup for games between the Essendon and Carlton football clubs and the AFLPA Madden Medal, awarded to footballers who make exceptional contributions to football, family and the community. During his career, Simon has picked up plenty of experience appearing on television and radio, public speaking and presenting. He has been in heavy demand by business, government, media, educational and sporting bodies for his views of business, sport and life. Never far from football, Simon has been often sought by AFL clubs to assist with ruck coaching. 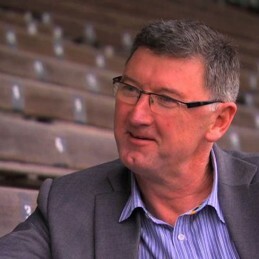 He has a continuing role as a director of the AFL players association and chairman of AFLPA Past Players Advisory Board. Simon has a passion for improving people. He understands the process of winning and what it takes to succeed. Simon is now focused on assisting organizations improve their people by using his experience and knowledge to provide philosophies, insights and processes to strengthen and develop teams. Simon believes that if you improve your people you improve your business. Simon has a range of services to inspire and connect people in exciting and innovative ways.